I am a HUGE fan of Mounds Bars! 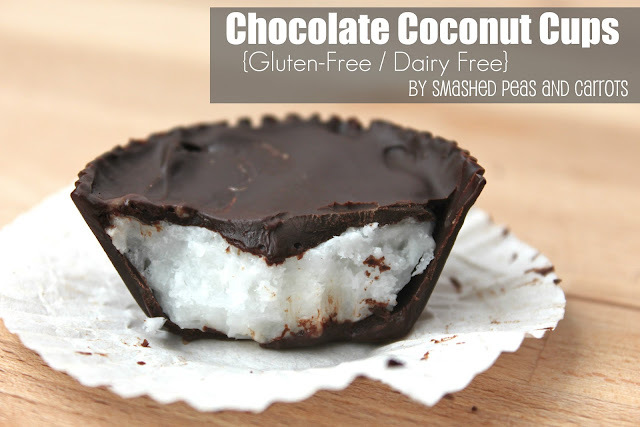 There is just something about the combination of coconut & chocolate that satisfies. I was beyond excited when I found this recipe for home made mounds that just so happen to be dairy free as well, WOOT! Try the recipe out, easiest dessert to make ever, and only 3 ingredients! I read an article about the benefits of eating coconut oil; not only does it have the potential to lower your chance of a heart attack, Women reported that they noticed a decrease in abdominal fat after eating a certain amount of coconut oil over a 12 week period. Not that I need more excuses to make these babies! Thank you Smashed Peas & Carrots for making my diet just a little easier! Click on the picture to be taken to the recipe. NO BAKING REQUIRED!